I was going to name this post “Taming the Tube” and that would have possibly been one of the weirdest titles I have come up with for a blog post so far but I decided to go with “Little Things, Big Smiles” as I have had a few things to smile about this week. They reminded me that it is often the little things that bring us most joy. Like the fact that my friends are on a road trip in Colorado and Wyoming and post pictures of every step of the way on Facebook so that I can be with them and share a little of the experience. And it seems that the Santa Cruz winter is over and I am back in shorts and tshirts before I can even run out of clean socks. As for the tube that needed taming, well, I am talking about tubular bands. I have been following on with the experiments I was doing last week. These little things have brought a smile to my face as I figured out at last how to stop them from spiraling. Yes, it’s just a small thing but it gave me quite a kick! Of course some bands look great when they spiral and that is precisely the effect that you want. But that wasn’t what I wanted when I made a pebble weave tubular band. 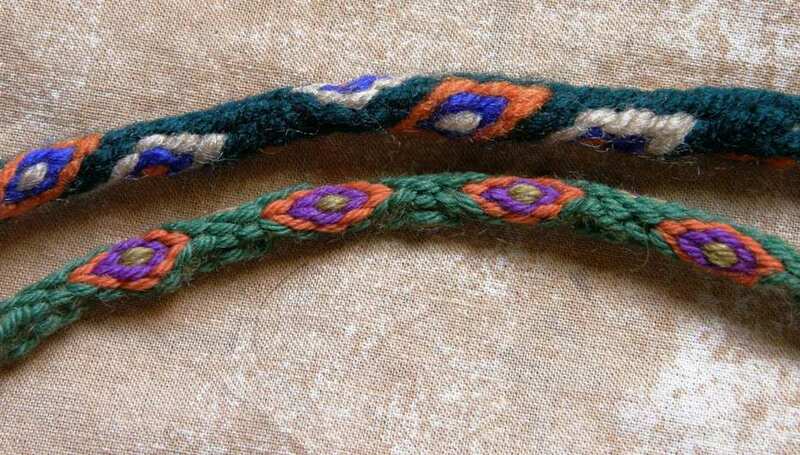 I wanted the woven design to lie straight along the tube so that it could be seen if the band was worn as a wristlet. I am forcing the design to lie straight in the upper picture. As soon as I let it go, it spirals. I suppose the spiral version has its own charm but that is not what I wanted. Most ñawi awapa bands that I have seen spiral…some to a lesser degree than others but there are some that pretty much don’t at all as you can see above. The more colorful ones in the center of the group spiral a lot while those above and below them have little or no twist. I LOVE that black one! So, clearly, there is a trick to getting them to lie straight. I fiddled with this and that. Many warps went into the trash. Luckily I have my mini warping board and so was able to quickly and easily set up tiny two and four-stake warps so not a whole lot of yarn was wasted. And then I got it! He he…big smile. 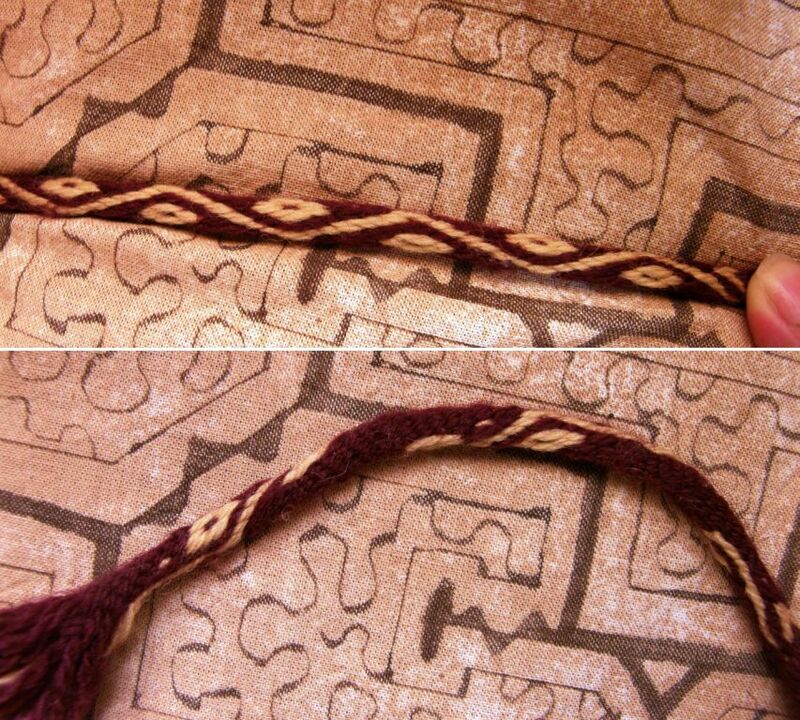 So there’s a spiraling ñawi awapa band that I made ages ago and, below it, one I made this week that behaves nicely and lies straight. Again, I say that both types have their charms…it just depends what you want and now I have options. 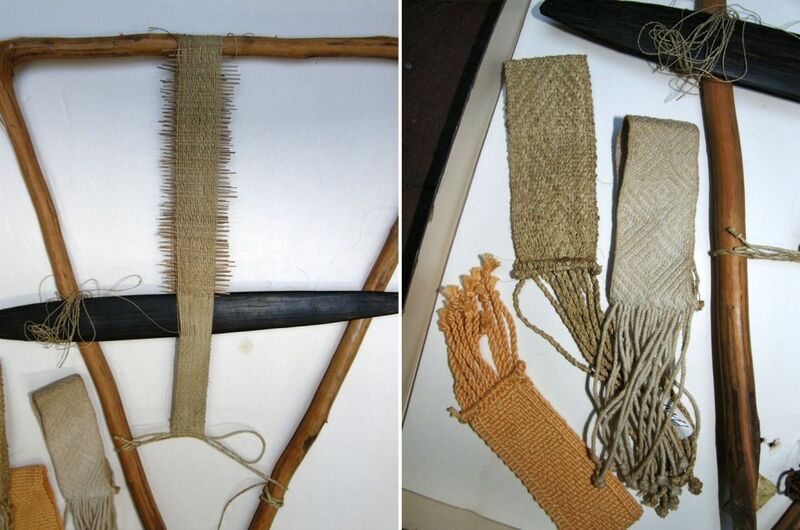 Of course, when tubular bands are sewn to cloth as in this example from Peru, they are forced to lie straight. 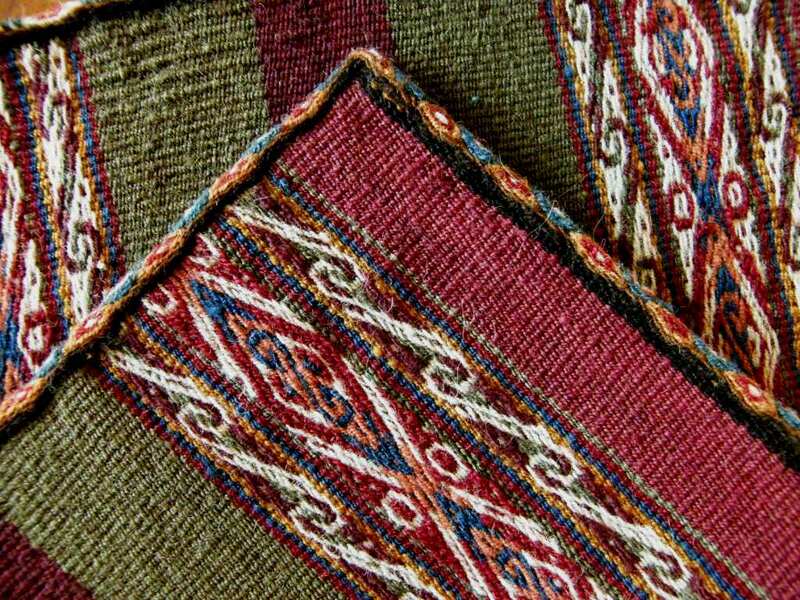 I was told by Nilda Callañaupa in Peru that tubular bands are sewn to pieces of cloth to help stabilize the edges and corners which tend to curl due to the highly overtwisted wool warp yarn that is used. Now I am wondering if the spiraling in the tube counteracts the curling in the cloth and is what allows the fabric to then lie flat. 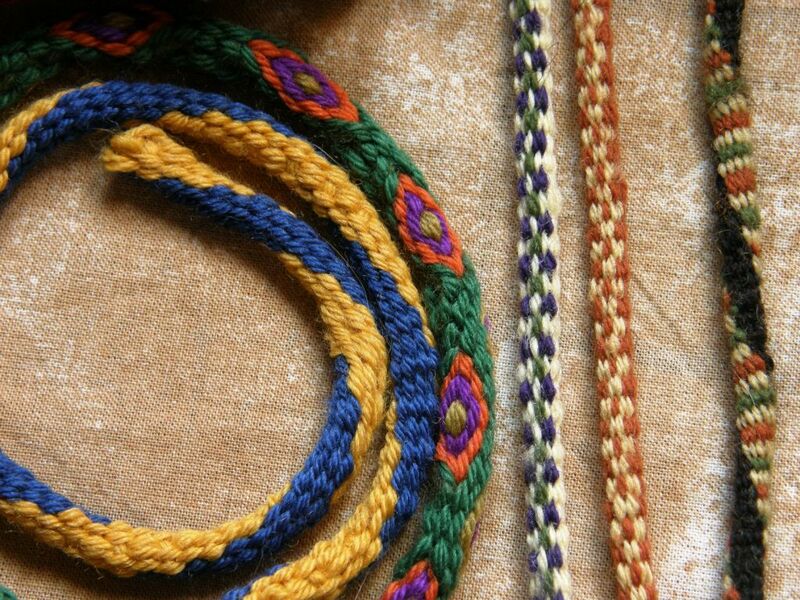 I have always sewn my tubular bands to very sturdy material…edges of bags which are doubled pieces of woven cloth so the spiraling nature of the band has not had any effect on the finished piece….no twisting or distortion of the fabric has resulted. So, after that, I just had to play with my new discovery and make some more tubular bands. Thick ones, thin ones, in cotton and wool. 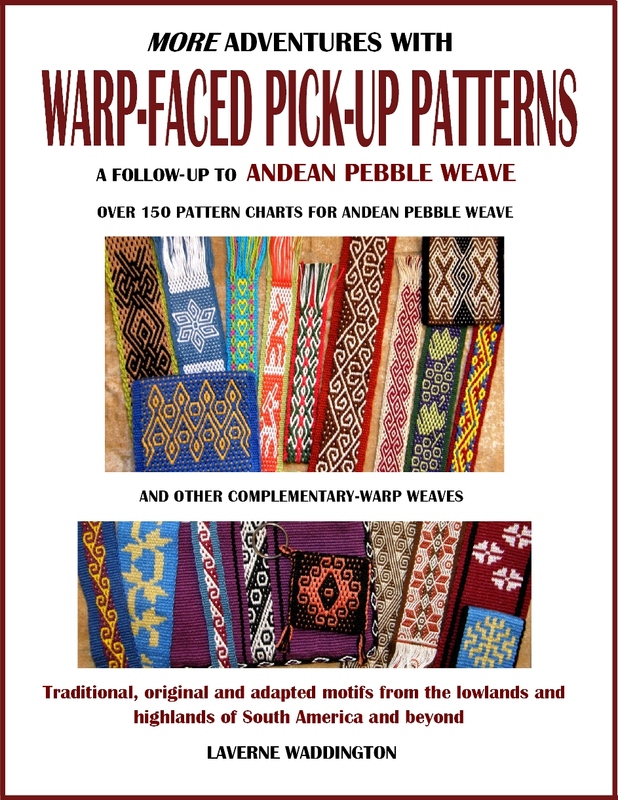 The wool ones are much smoother and prettier….ñawis with their diverted and twisted warps, plain-weave, pebble weave and warp substitution tubular bands. 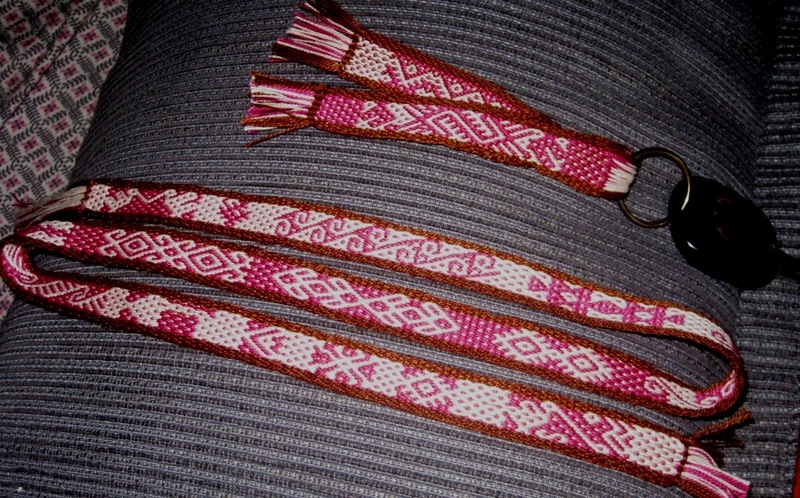 Maybe next time I am in the US I will get some caps and clasps and make some wristlets with these although maybe I should just go down to the Buckle Land store in the street market here and see what I can find. These were collected and also reproduced by Anne Blinks and Nora Rogers and now form part of Martha Stanley’s collection. 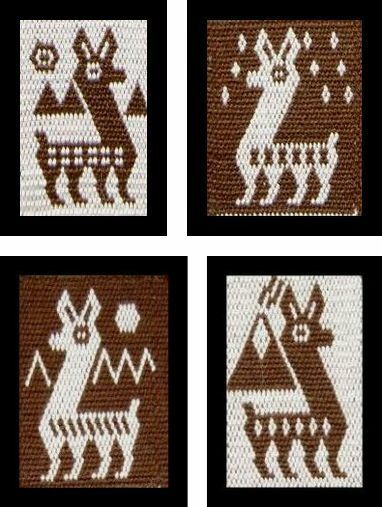 I believe that they were made by the Mayoruna Indians of Peru who live in the same region as the Shipibo in the Upper Amazon Basin. 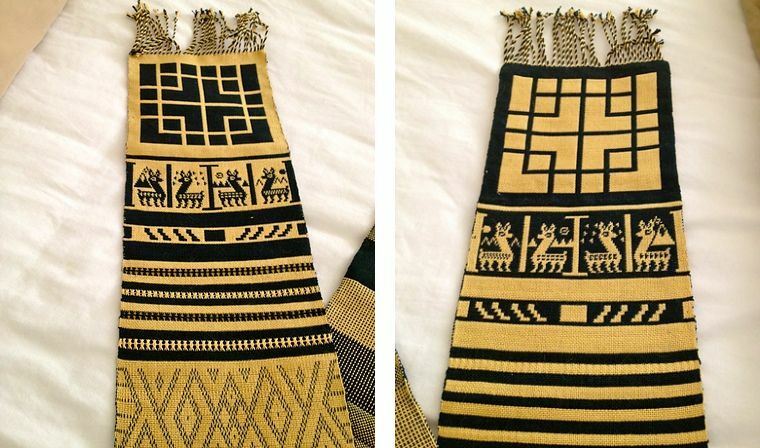 I was given one of Nora Rogers’s pieces in progress on the loom as well as a booklet on the technique from my friend Betty’s vast collection of resources on ethnic weaving techniques. There it is all ready to be studied! From tiny to tremendous, I pulled out this monster project this week too…. My tubular bands look quite ridiculous next to it! That thing is heavy! It is was very weird sitting down to it after not having touched it for so long. It took me a while to get back into the rhythm…which swords do I use when and what sequence of moves had I decided were the most efficient? 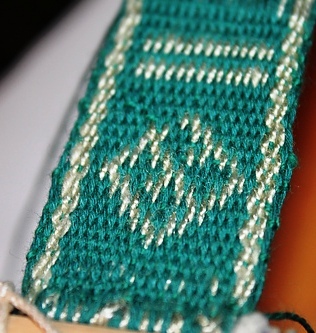 Once I was back into it, the first thing I noticed was a mistake in the new pick-up pattern I am weaving which would have had very sad results further down the track. 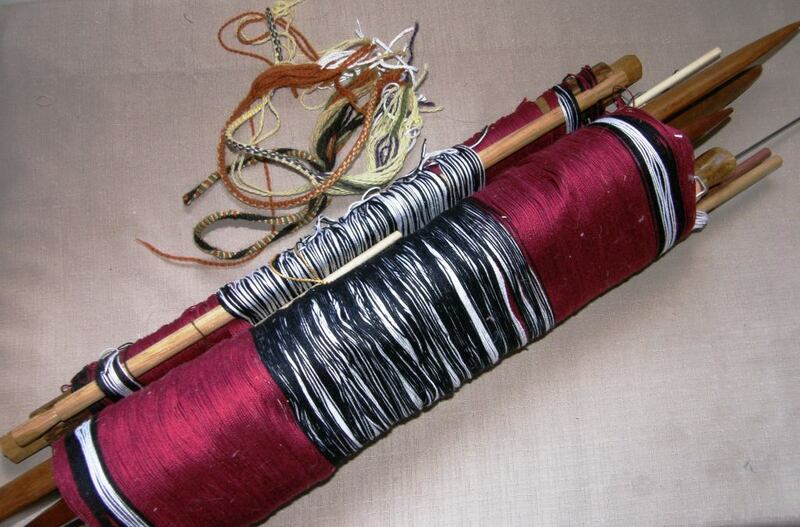 That meant that my first task was to un-weave….sigh! but I am smiling about having caught it in time. Yes, progress is slow on this piece but if you are thinking that I am getting nowhere, let me show you that I have least gotten the design established. Most of the major scary counting is now over as each row of pick-up is now done based on the last, if you know what I mean….simply moving a little to the right or the left as the diagonal lines form. 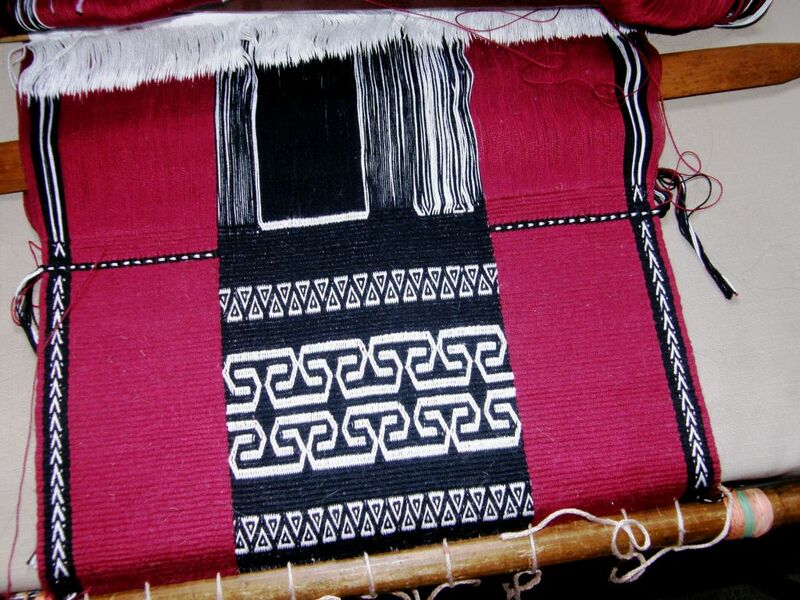 It is always exciting to be doing a new design and especially this one as it is my own adaptation of a traditional si’ira pattern of the Wayuu people from Mirja Wark’s book. After all the adjustments I made to have it fit my piece, it now has a lot of my own touches and so I am curious to see just how it will turn out. 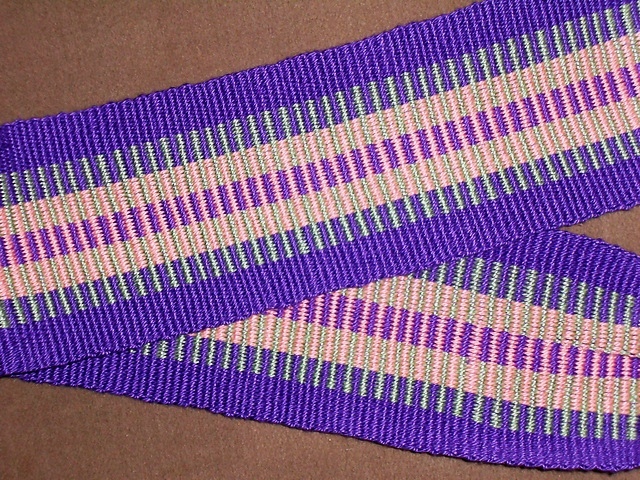 So, this week I “tamed the tube” and smiled at many things…like seeing Jeen zooming on after having woven with her and enjoying herself with my pebble weave book using her rigid heddle loom. She is now an active member of the Ravelry group. 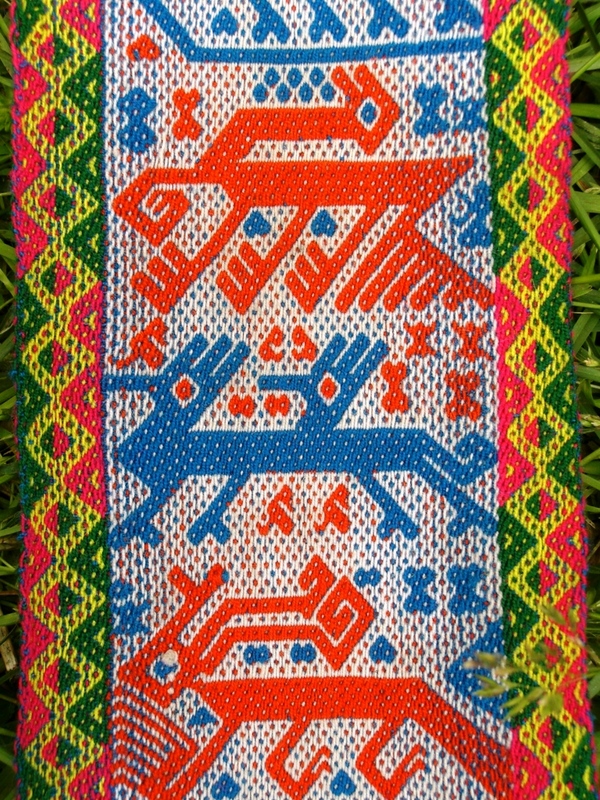 Now that she has woven the bird motif, she plans to try it with that gorgeous multi-color warp. And Marge, who also wove with me, is trying warp substitution with Bedouin patterns as a warm-up to double weave. She was a bit dismayed by the long floats on the back until we assured her that that is what happens with warp substitution. She will be able to take the skills she learns from this experience a step further when she tries double weave. 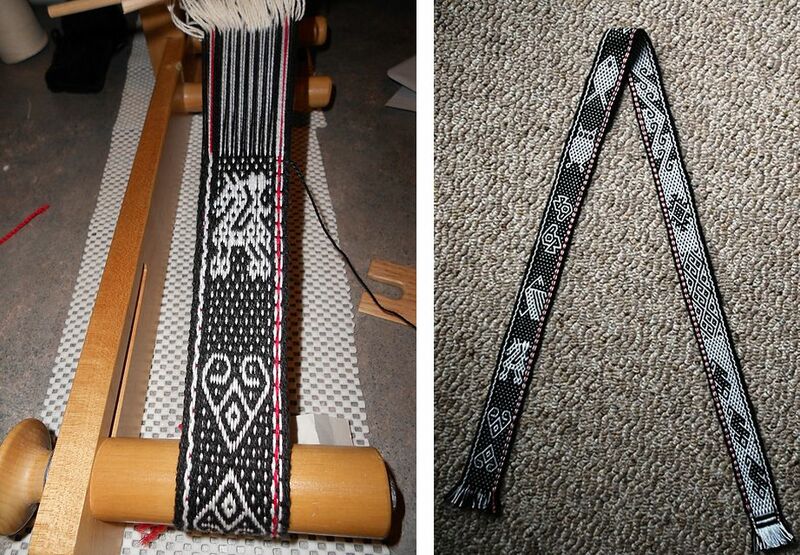 And then made a pebble weave band on her inkle loom using many of the motifs from my book. 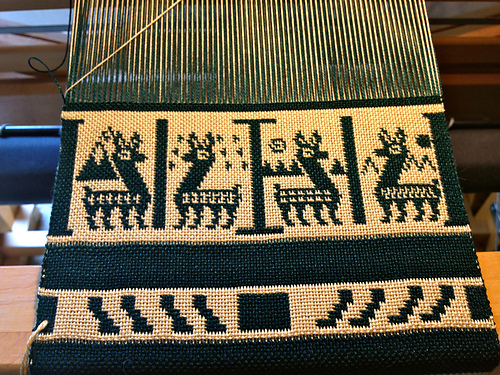 Here they are in warp-faced double weave…the little llama heads come from a Bolivian band. I added the body embellishments and backgrounds. 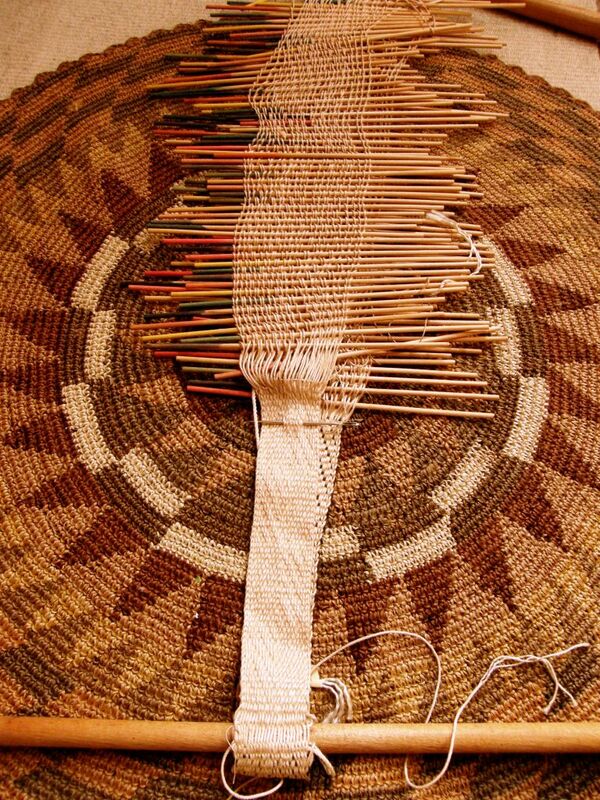 And here is Jenibug’s balanced weave project…How neat is that?! And here it is off the loom and wet finished. Are you sitting down??? Isn’t that spectacular? 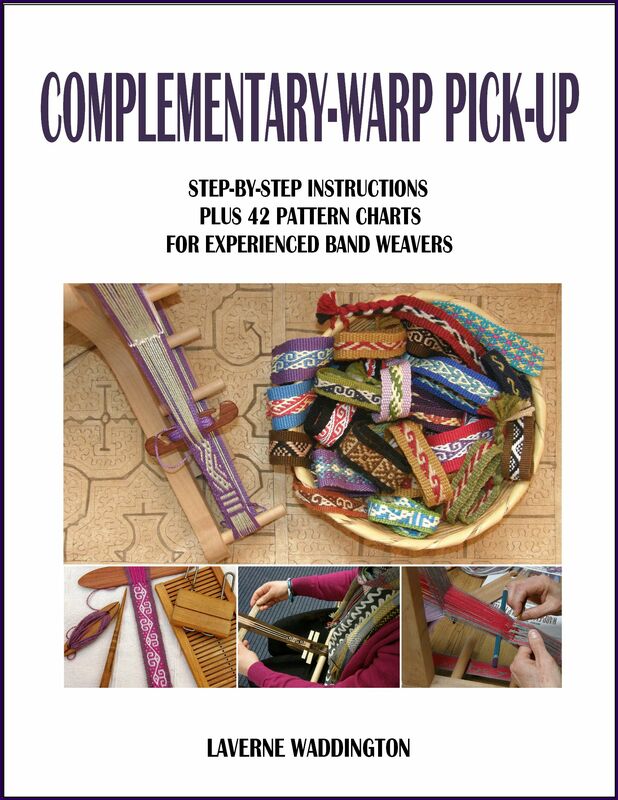 She took my charts and translated them to balanced weave pick-up…blows me away! 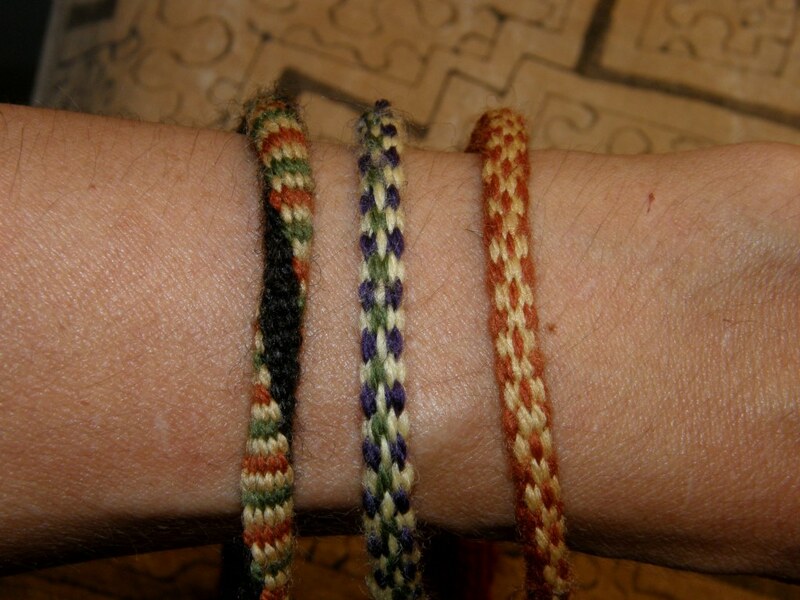 And here are Loli’s pebble weave projects…beautiful bands! Now can you understand why I am smiling big smiles?!! My experiment with tubular bands brought a smile but seeing cool stuff being made by the Ravelry folks is the best weaving therapy of all. 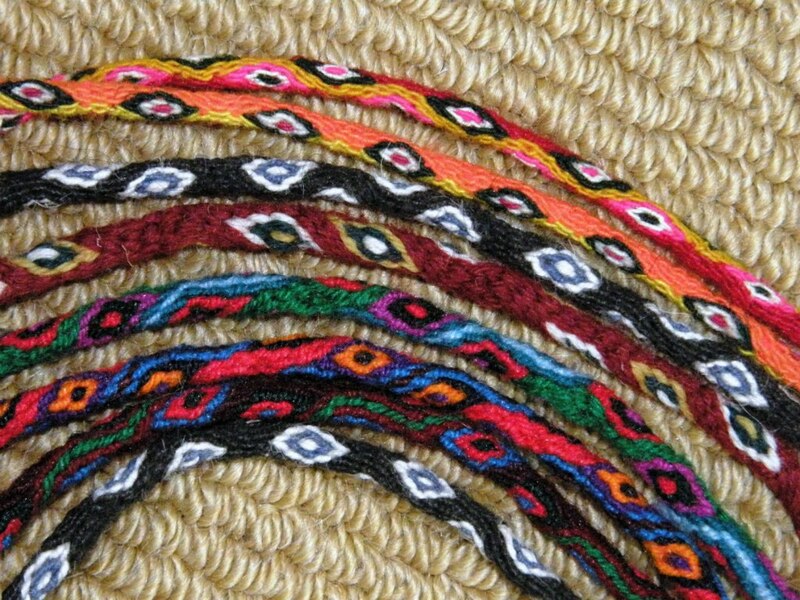 And just in case your socks are still on after seeing all that, I will leave you with another picture of one of the stunning bands from Ayacucho, Peru that I saw at Maryland Sheep and Wool Festival. 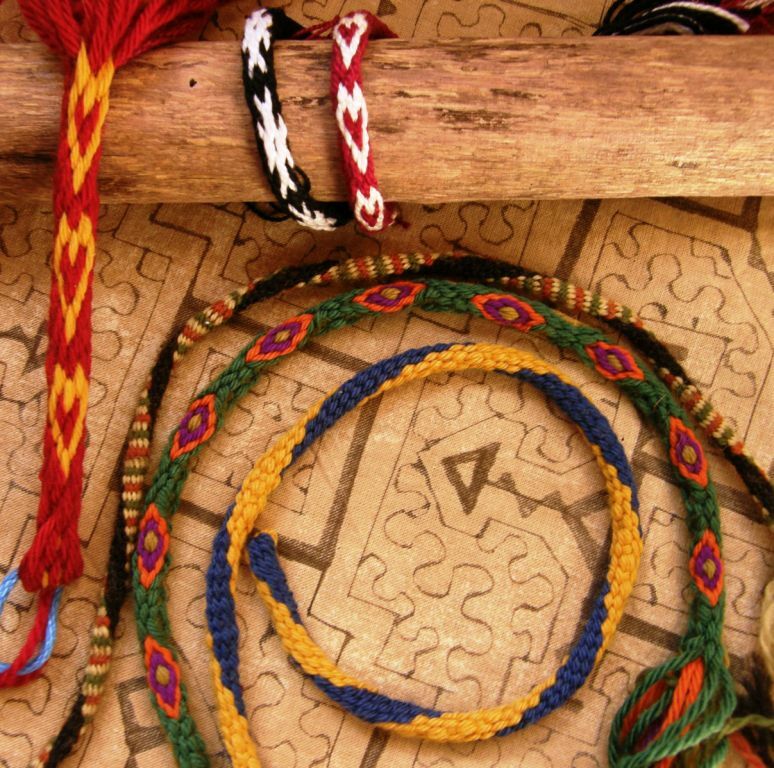 I will leave you with bright cheerful colors and these playful figures, one of which is so similar to the ones I was taught when I studied pebble weave in Peru. I must have missed something in your article. I don’t see your “trick” to getting the tubular bands to lie flat. Please explain more fully. Hi Kathy, I just wanted to show you all some of what I had been up to this week. That’s all. 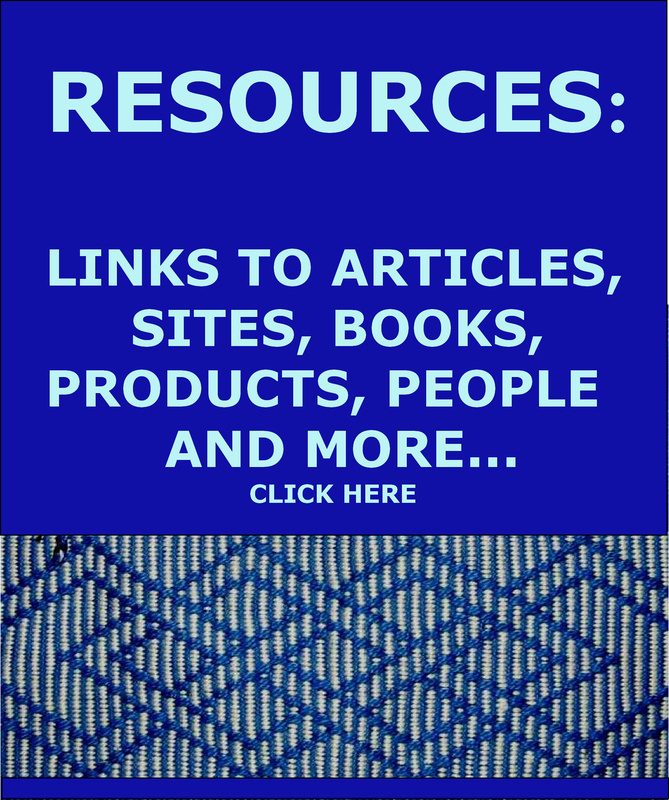 This one is just a blog post,not an article, not a tutorial this time. No conozco nadie en Barcelona que esta trabajando con telar de cintura. Espero que encuentres alguien con quien puedes compartir y aprender. hi laverne, wow what a stunning blog so much colour and the tubes look so good i will have to try these thank you. i’m french and i did a trip in south america and i discovered nawi awapa in bolivia. i fell in love with it! 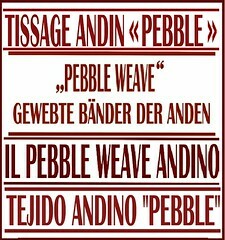 i missed the weaving lessons in cuzco and since that day, i’m learning by myself thanks to your book ‘pebble weaving’. Can you tell me if your second book contains nawi awapa tutorial? 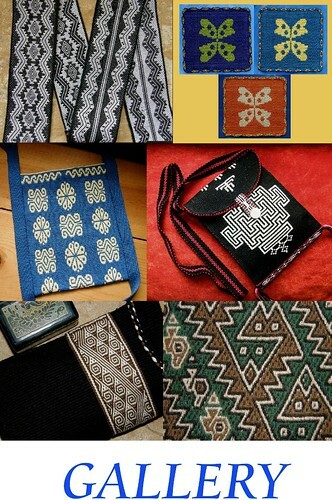 will your book be translated in french (because i’m already struggling with weaving so i would not like to struggle with english too!!). Hi Morgane. I am glad that you have been using and enjoying my first book and am very grateful to Sandrine for having translated it for me. I am sorry,but my second book is only in English and I doubt that I will ever have it translated to French. Besides, I don’t teach the nawi awapa band in the second book.